We are now back in North America for the winter, and I’m busy filling up my freezer with nutritious soups and stews that I freeze in individual containers for quick and easy lunches. 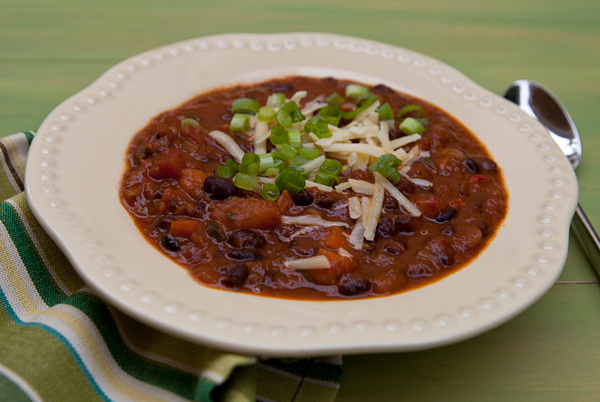 Chili is one of my husband’s favorite lunches, and I like to add lots of vegetables for texture and added nutritional value. 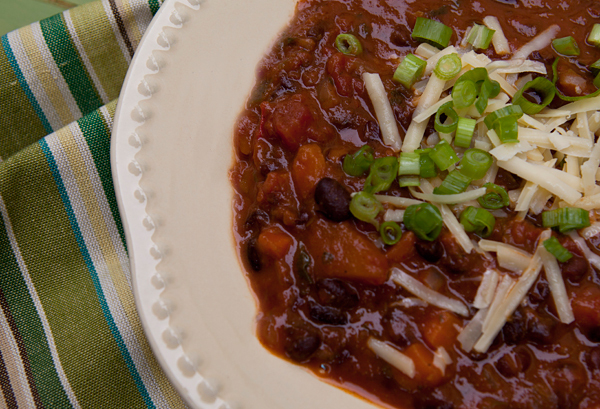 Since we like our chili on the spicy side, I used dried ancho chiles for this recipe which added a nice smokey heat. 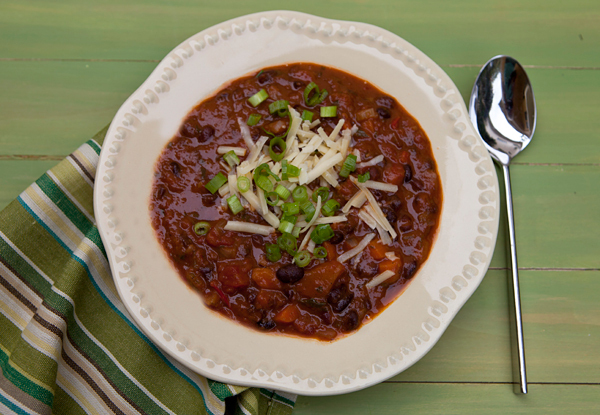 If you prefer, you could use less of the ancho variety, or use another type of chili you prefer. This is a meatless chili, but again, if you’d like to add in some meat, I’d suggest ground turkey or chicken would work really well and keep the dish nice and lean. Since I am presently enjoying cooking with all the winter squash available to us here in North America, I added an entire butternut squash to this chili, and loved how the sweetness of the squash combined with the smokey hint of the ancho chili peppers. Tomatoes and peppers are a source of vitamin A, vitamin C, dietary fiber and a great source of lycopene, a powerful antioxidant. Place the chiles in a bowl and cover with boiling water and let sit for 15 to 20 minutes. Strain the liquid and place in a saucepan and cook until the liquid has reduced to 1 cup. Finely chop the chiles and mix into the ancho liquid. In a large stock pot, heat the olive oil and cook the onions, celery, and carrots for 5 minutes, stirring often. Add the next 11 ingredients along with ancho chiles, reserving just the cilantro for later and bring to a boil. Reduce the heat to a simmer, and cook for 45 minutes to an hour, or until the squash is tender, and the chili has thickened. Stir in the chopped cilantro and taste, adjusting seasonings as needed. Serve in individual bowls, with garnishes as desired.